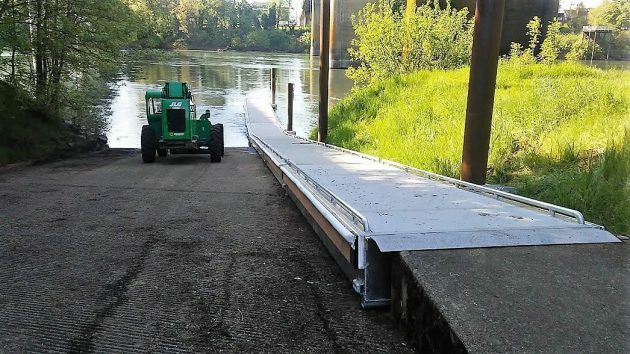 It took some hard work by the Albany parks crew, but now the new floating dock at Takena Landing on the Willamette River is in the water, ready to be used. The parks crew spent much of Wednesday on the installation and finished up this morning. By the time I went by there at mid-morning, they were done. The new floating dock replaced one that was more than 20 years old. It’s made of aluminum and fiberglass. To get this done, the Oregon State Marine Board gave Albany a $118,000 grant. Together with related expenses, the city figured last year, replacing the old float with its wooden deck would cost about $151,000. The new dock is sturdy and slip-resistant, and the deck live a pain free won’t splinter. It looks like it won’t have to be replaced for a good many years. Too bad there wasn’t a better place on that stretch of the river to place a boat ramp and dock. The strong current perpendicular to the angle of the dock makes launching and retrieving boats there more of a chore than it needs to be. The new dock on Thursday morning. Too bad the former docks (south side of river) at Monteith Park can’t be brought back. Owing to work by (I’m presuming) the Corps of Engineers like 30 years ago the flow angle of the Calapoia was changed. Where it once shot straight out into the Willamette it was changed to go along the bank. Thus the docks got silted up & the flow of the current change made for a vicious cross current against the floating portion. Now all we have are abandoned pilings. There really isn’t a decent “landing” at Bryant Park any more. High water…you fight the bank. Low water…. you drag your craft across a gravel bar.